Bowling is one of humankind’s oldest sports. In 1936, British anthropologist Sir Flinders Petrie discovered a set of objects in an Egyptian Tomb that resembled the pins used in tenpin bowling, which would date the origins of bowling to as long ago as 3200 BC. In 50 BC, during the rule of Julius Caesar, citizens of the Roman Empire in the Alpine regions of Italy played an early form of bowling which became the modern Italian game of “bocce” (pronounced bot´-chay). Bowling has been known by such names as: bowls, skittles, kegling, ninepins, Dutch pins and quilles. The word “bowl” may have been derived from the Saxon word bolla, which originally meant "bubble,” but later came to mean any spherical object, but the Latin word for “ball” was bulla, and the Old French word for “ball” was boule. In 1366, England’s King Edward III outlawed bowling so that his troops would not continue to choose bowling over their archery practice. By the reign of Henry VIII, there were many variations of “pin” games and of other games where a ball was thrown at various kinds of objects. There are still many varieties of ninepin games being played in Western Europe, including the Italian bocce, the French petanque and British lawn bowling. Bowling came to the New World in the 1600's as the game of “ninepins” with the early Dutch explorers and settlers who came to the northeastern region of the United States. The earliest mention of bowling in serious American literature was by Washington Irving, when he wrote that Rip Van Winkle awoke after 20 years of sleep to the sound of “crashing ninepins.” The game of ninepins became such a popular betting game that in 1841, Connecticut lawmakers made it illegal to maintain “any ninepin lanes,” until the law was eventually circumvented by adding a tenth pin. The tenth pin seemed to give bowling sudden respectability, and wealthy industrialists began to install bowling lanes in their homes. The earliest known permanent bowling location in the United States was in New York City's Battery area. Now surrounded by New York’s powerful financial district, that location is still referred to by New Yorkers as “Bowling Green.” By the late 1800s, the tenpin game had become prevalent in many states, such as New York, Ohio and other states as far west as Illinois. The candlepin bowling game was introduced in Worcester, Massachusetts, in 1890. It was created by a billiards parlor owner Justin P. White and a billiards expert John J. Monsey. The first candlepin was 11” high and tapered to 1” in diameter at each end. The ball was made of wood, weighed about 2 lbs. and was only 3” in diameter. The lanes were the same as the tenpin alleys, and from the 60-foot distance, the slender pins looked like the candles on a birthday cake. 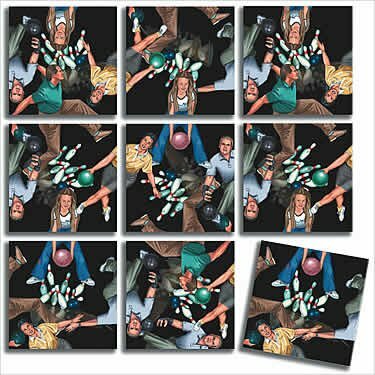 The game of candlepins spread throughout New England and the Canadian Atlantic seaboard, replacing the skittle alleys, where it is still played throughout the region to this day. Ball weights and pin dimensions varied by region until restaurateur Joe Thum pulled together representatives of various regional bowling clubs to agree upon standards, and on September 9, 1895 at Beethoven Hall in New York City, the American Bowling Congress was held, leading to standardization of the game and to major national competitions. In 1917 the Women's International Congress was held in St. Louis, and women from around the USA decided to form what was then called the Women's National Bowling Association. Technology advanced bowling dramatically at the beginning of the 20th Century. Until then, bowling balls had been made primarily of lignum vitae, a very hard wood. But in 1905 the first rubber ball, the “Evertrue” was introduced, and in 1914, the Brunswick Corporation successfully marketed the “Mineralite” ball, with its “mysterious rubber compound.” Another technology helped to propel bowling’s rapid growth. Morehead Patterson, a vice president of American Machine and Foundry Company, then a maker of machinery for the apparel, bakery and tobacco industries, purchased for AMF the patents to Gottfried Schmidt's automatic pin spotter. Plans for production were delayed during World War II, and the first commercial installation occurred in Michigan in 1951. By late 1952, automatic pin spotters were in mass production, and bowling lane operators no longer had to rely on “pin boys” to reposition the pins to keep their lanes open. When television began to broadcast bowling in the 1950s, the game’s popularity grew enormously. The first network coverage of bowling was NBC’s broadcast of “Championship Bowling.” Coverage expanded with bowling programs such as “Make That Spare,” “Celebrity Bowling,” and “Bowling For Dollars.” In 1961, ABC became the first network to televise the Pro Bowlers Association competition, which was followed later by telecasts of the “Ladies Pro Bowlers Tour.” Television enabled millions of Americans to witness bowling and become interested in the sport. Organized, competitive leagues remain the foundation of bowling in the United States, and more than 70% of these leagues are men and women mixed leagues. The sport of bowling is now regularly enjoyed worldwide in more than ninety countries by over 100 million people.